Ever since discovering that she was adopted, Ada Rupp has not been entirely content with life in her Amish community. While her long-term illness has stabilised itself, her mother still hovers over her, controlling her life out of fear that Ada may fall sick again. Still single and in her twenties, Ada hopes that she may have caught the attentions of Will Gundy, a close friend and widower with three children. But after rumours about Will and Leah Fisher begin to surface, Ada hangs all of her hopes on being appointed teacher of her community’s one-room schoolhouse. If she can’t have a family of her own, being a teacher would somewhat satisfy the longings of her heart. However, it appears that God has other plans for her, as soon after the teaching position is given to Leah, Will’s grandmother offers Ada the chance to visit her ancestral family home in Switzerland. An issue over the ownership of the land has arisen, resulting in the need for members of the two Amish families who own the land to travel to Europe in order to resolve matters. Will’s oldest daughter, Christy, will be travelling with them, giving Ada the chance to try out her teaching methods on the girl, who is still hurting from her mother’s death and refusing to learn anything at school. Will this chance to travel to Europe and act as a nanny to the daughter of the man she has come to love enable Ada to see God’s plan for her life? Or will it open her eyes to the adventures and temptations of the world, making it even more difficult to settle when she returns to her Amish community? Having first been introduced to Mindy Starns Clark earlier this year when I read Secrets of Harmony Grove with my book group, I was pleased to see that she was choosing to focus on Amish fiction with her upcoming Women of Lancaster County series. I’d quite enjoyed reading Secrets of Harmony Grove, but had found it a bit dark in places and the mystery rather convoluted. As it turns out, this series is more to my liking. Mindy and Leslie – both established authors – team up together to write about the lives of women who are all somehow related to an Amish family in Pennsylvania. In the first book, The Amish Midwife, adopted Lexie travels to Pennsylvania after she discovers that this is where her biological family live. The Amish Nanny follows on from her story as her younger sister, Ada, comes to terms with the changes that have occurred in her life since meeting Lexie. While Lexie has found peace in her life after reconnecting with her Amish family, Ada no longer feels content in the life that she has always known. 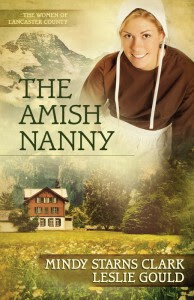 The Amish Nanny follows Ada’s journey to discover who she is and where God wants her to be in life. Although they’re both very different characters, I loved Ada’s story just as much as Lexie’s. Mindy and Leslie have really stretched the Amish genre by including mysteries surrounding family trees and adoption, not to mention a wealth of information about how the Amish came to be in the United States. While the first book dipped into the history of the Anabaptists, I learned a lot more from Ada’s travels in Switzerland. Even I, a student of history who has read a lot about the religious upheavals in Europe during this period, still had a lot to learn about the Anabaptists and their persecution and subsequent emigration. This is definitely one to read if you feel that you’re getting bored with similar plots being repeated in Amish fiction, or would like something with a bit more depth. That said, you don’t have to be a historian to enjoy this book. Mindy and Leslie weave all of the information into the book in a way that makes it easy to understand and doesn’t detract from the story. I would suggest that you might enjoy Ada’s story more if you’ve read the first book in the series, but a lot is summed up for those readers who choose to jump right in with The Amish Nanny. But fans of the series will be pleased to catch up with Lexie and her cousin Ella, who will be the protagonist of the third book. Ada also gets the chance to meet Giselle, her biological mother, who has been living in Switzerland for several years. While a lot of the book is spent focusing on the mystery of the ownership of Amielbach and locating the documents to prove this, Ada and Giselle have some healing to work through together. Ada really grows as a character throughout the book, and comes to define her identity not in terms of her family or her illness, but who she feels God is calling her to be. Although events in Pennsylvania have caused her to doubt her desire to be a teacher, wife and mother, her experiences in Switzerland help her to trust God’s will for her life. She’s helped by Christy, her charge on the trip, and Morgan, an English girl she meets on the journey to Switzerland. It was lovely to see Christy’s character also developing, as she slowly got over the fears that had emerged since her mother’s death. Morgan was a really fun character to read about as well, and I hope the authors may have plans for a cameo for her in future books. The Amish genre is truly blessed to have Mindy and Leslie working to create new, unique fiction for its fans to enjoy. Their Women of Lancaster County series is likely to be enjoyed by all Amish readers thanks to its wonderful blend of mystery, family drama and romance. The Amish Nanny is a wonderful addition to the series and I hope that others will enjoy Ada Rupp’s story as much as I did. LOL! You're popular for awards, Rachel. :-) I've given you the Liebster Blog Award over on my blog "Gwendolyn Gage ~ Serving Through Words". Congratulations! Following from GoodReads! I really love your blog.